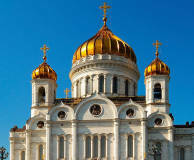 The Cathedral of Christ the Saviour is the largest Orthodox cathedral in Russia. This majestic Moscow cathedral erected on the bank of the Moskva River opposite the Kremlin was built to gratify God for saving Russia from Napoleon’s army invasion. 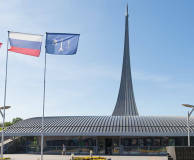 The Museum of Cosmonautics is the largest space museum in Moscow. It is located on the ground floor of the Monument to Conquerors of Space. In this Moscow museum you can see the personal possessions of the first cosmonaut, the first spacesuits, etc. The Chambers of the Romanov Boyars museum is situated in the 15-17th century chambers near the Kremlin. It is part of a unique architectural ensemble in Varvarka street. The chambers are thought to be the birthplace of the first tsar of the Romanov dynasty. The Armoury Chamber of the Kremlin (rus - Kreml) is an amazing treasure house museum. 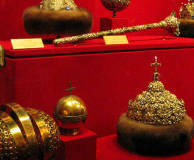 Its collection is made up of unique items, which were preserved in the royal treasury and in the Patriarch’s sacristy. These include personal belongings of Russian tsars. 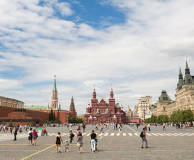 Red Square is the heart of Moscow and the main square of Russia. 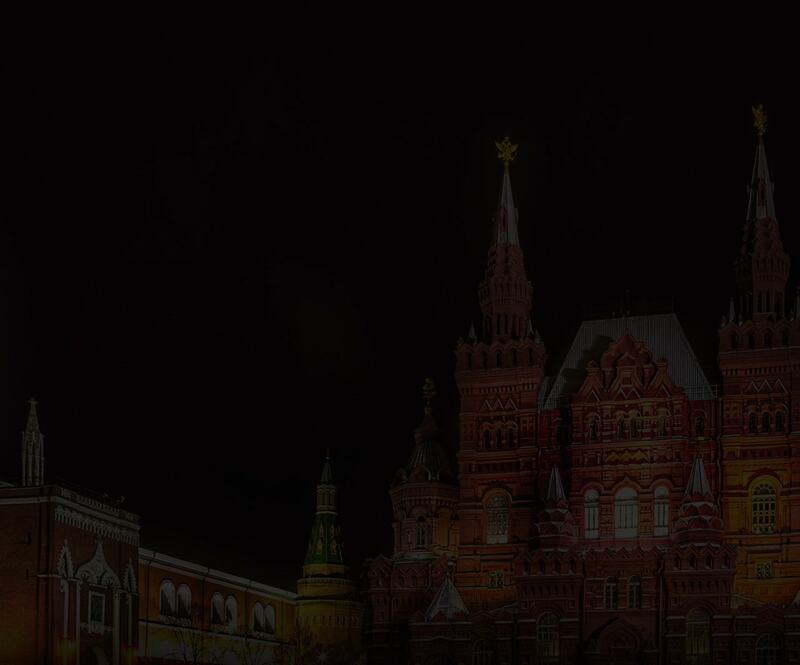 Its monuments embody Moscow’s centuries-old history in all of its manifestations. Few squares in the world combine churches, defensive walls, towers and museums in a single space. In the Moscow Kremlin there is a Diamond Fund, sharing a building with the Kremlin Armoury. 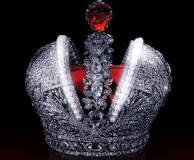 There are natural diamonds, nuggets, and strikingly beautiful jewellery from various historic periods, of which the Imperial Crown of Russia is considered to be the gem. 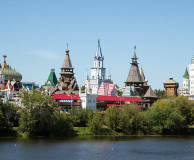 Kitay-gorod, also referred to as the Great Possad, is an area of Moscow located east of the Kremlin Red Square. 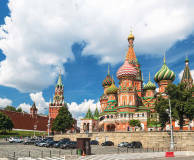 This is where the earliest streets of Moscow are preserved, as well as numerous unique monuments of architecture, and an active government district. 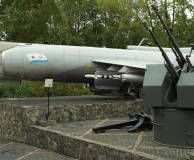 Zamoskvorechye is an exceptionally interesting district southward of the Kremlin. This is a favourite place for Muscovites. Many streets and lanes have undergone reconstruction and now feature broad sidewalks, stylish lanterns, benches and cycling lanes. 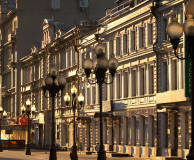 The Arbat is one of the main tourist venues of the capital, with its unparalleled atmosphere. There are not many streets in the world where such an incredible collection of outstanding artists and cultural figures have lived and worked in such close proximity. 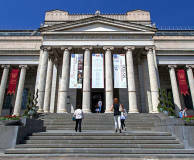 The A.S. Pushkin State Museum of Fine Arts is one of the largest Moscow art museums in the capital. It exhibits a great collection of foreign art and full-size plaster models of major monuments of the ancient, medieval, and Renaissance periods. 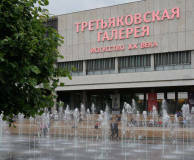 The State Tretyakov Gallery is one of Russia’s largest art galleries. 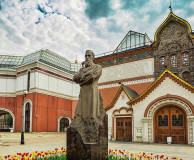 The Tretyakov Gallery mainly exhibits classical Russian art – paintings, sculptures, icons, and works of decorative arts and crafts from the 11th to the early 20th century. The branch of the State Tretyakov Gallery on Krymsky Val is entirely devoted to 20th century Russian art. 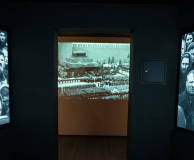 It is there that you can see the first version of Malevich’s "Black Square", Tatlin’s "Letatlin", Mashkov’s still lifes and Konchalovsky’s portraits, etc. 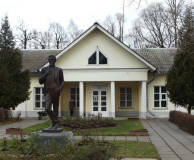 The Chekhov State Literary and Memorial Museum in Melikhovo near Moscow is one of the most interesting house museums dedicated to A. Chekhov. This place has preserved the mansion perfectly, as well as the outbuilding, and the garden of the estate. 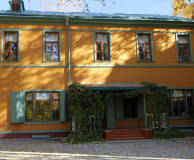 The Leo Tolstoy estate museum in Khamovniki is a historical building which used to belong to Tolstoy himself. The museum is notable for the fact that everything here is just the way it was when Tolstoy lived here in 1893-1895 as if the time has been frozen. 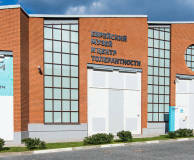 The museum of the great Russian artist V.A. Tropinin is located in Zamoskvorechye. 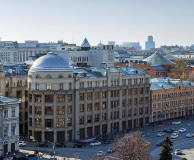 It is housed in a 19th century building, a sample of the Moscow merchant mansion, and presents true masterpieces of 18-19th century fine art, including unique furniture, etc. 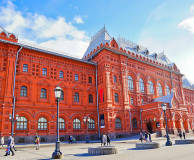 The Museum of Patriotic War of 1812 opened its doors in Revolution Square, the heart of Moscow. It tells the story of one of the most complicated stages in the history of Russia, its victory over Napoleon and its role in the release of Europe. 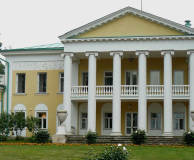 Gorki Leninskiye is one of the most famous estates in Moscow Oblast. 19th-century furnishings are well preserved here. 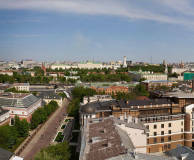 The complex includes the Lenin Museum, Lenin’s memorial flat recently transferred from the Kremlin, and the Scientific and Cultural Centre. The Novodevichy Convent is one of the most beautiful architectural monuments in Moscow, a true masterpiece of the 16th–17th cent., that played a crucial role in the history of Russia. The Novodevichy Convent is an example of Moscow Baroque architecture. Kolomenskoe is a sightseeing attraction in the south of Moscow which served as a residence for Russian grand princes and tsars for many centuries. Today, it is home to the Kolomenskoe Historical, Architectural and Natural Landscape Museum Reserve. The Vadim Zadorozhny Vehicle Museum is a private museum of vintage cars, motor bikes and military vehicles, one of the largest in Europe. The museum displays cars which belonged to Soviet leaders, numerous antique cars of the 1900s–1940s and much more. The Moscow Metro is considered one of the most beautiful rapid transit systems in the world. 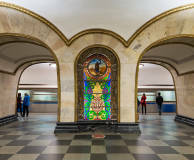 Each of its 222 stations is unique in its own way, and many of the stations built in the Soviet era are recognised as masterpieces of Moscow architecture. 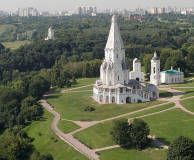 Izmailovo is both a large district of Moscow and a well known park. The earliest reliable data on the village located on this site dates back to the 15th century. The beauty of this protected green area rivals that of the capital’s best parks. 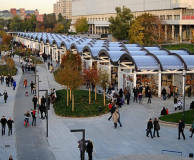 Muzeon Park of Arts is a large and well-planned plot of green land stretching along the River Moskva. The key theme of Muzeon is the art of sculpture. There are over 700 sculptures here in total, including the monuments of Soviet period, and modern sculptures. 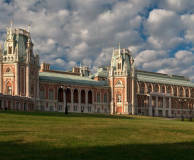 The Arkhangelskoe Memorial Estate is one of the most wonderful attractions near Moscow. 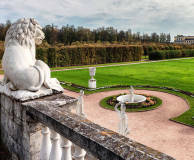 This is the estate which used to be owned by Russia's richest aristocratic families of the 18-19th centuries including the Sheremetevs, the Yusupovs, and the Golitsyns. 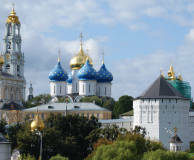 Sergiyev Posad is a small city 70 km from Moscow that became an open-air collection of church architectural masterpieces. Established here in the mid-14th century, the Trinity Lavra of St. Sergius is the largest friary and religious awareness centre in Russia. 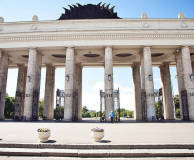 Gorky Park is located in central Moscow and is the city's most popular park, offering a wide variety of leisure activities ranging from relaxed strolls to modern art exhibitions. 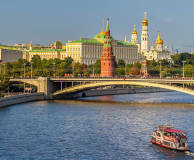 The park stretches along the picturesque embankment of the Moskva River. 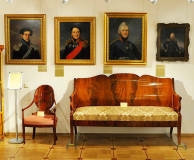 There is a truly remarkable Moscow art museum located on a quiet lane near the Garden Ring in Moscow. 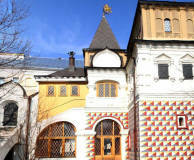 The museum is the house of Viktor Vasnetsov, a famous Russian artist. 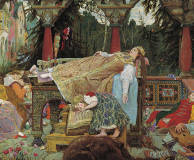 Viktor Vasnetsov is a past master of painting who created the Neo-Russian style. 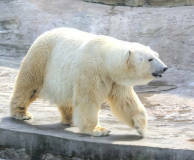 The Moscow Zoo is one of the oldest zoos in Europe. Located in the city centre, the zoo is a favourite place for families with children and a popular tourist attraction. The zoo is home to about 1,100 species including a number of rare species of wild fauna. Tsaritsyno is one of unique sights in the southern part of Moscow. It's a historical, natural and architectural ensemble with a palace and park complex dating back to the second half of the 18th cent. It was founded in 1776 by the order of Catherine the Great. The Moscow Kremlin is one of the most important examples of Russian architecture and Europe’s largest fortress. For years, the complex grew larger every time it was reconstructed until it reached its current size in the 15th century, during the reign of Ivan III. The Saint Basil's Cathedral dates back to the era of Ivan the Terrible. It is the most famous symbol of medieval Russian architecture. This ornate complex of nine churches built on a common foundation occupies the vast expanse of Red Square in Moscow. The State Museum of GULAG History is dedicated to the tragic chapters in the history of Russia – political repression and the labour camp system of the Stalinist period. For two decades, 15 to 17 million prisoners have passed through the GULAG system. 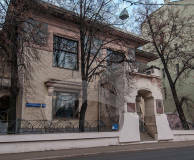 The Memorial Museum of Maxim Gorky on Malaya Nikitskaya Street is one of the most beautiful house museums in Moscow, built in a unique art nouveau style. Here, you will experience the life and creative work of Maxim Gorky, a five-time Nobel Prize nominee.